Laparoscopic distal pancreatectomy (LDP) is generally the treatment of choice for diseases of the pancreatic body and tail. Most surgeons prefer the spleen- and splenic vessel-preserving technique (SPVP-LDP) in benign/borderline pancreatic disease because complications of splenic infarction and gastric varices can arise after Warshaw technique. This study was aimed to determine the true learning curve of the SPVP-LDP procedure not LDP including Warshaw technique. Data were collected retrospectively from all patients who underwent a LDP between June 2007 and April 2017 at Gangnam Severance Hospital. We used cumulative sum control chart (CUSUM) analysis to assess the learning curve for the SPVP-LDP technique. Eight-three patients were performed LDP and we excluded patients who underwent robotic approach (N = 10) and open conversion DP (N = 8). Patients who underwent SPVP-LDP procedures were categorized into Group 1 (primary end-point). Those who underwent LDP procedures with splenectomy and the Warshaw technique were categorized into Group 2. We found that the 16th case was the cutoff point and the mean length of hospital stay was 13.0 days in the first period and 8.7 days in the second period (p = < 0.001). These results indicated that the frequency of SPVP-LDPs had increased and that technological progress had been made over time. 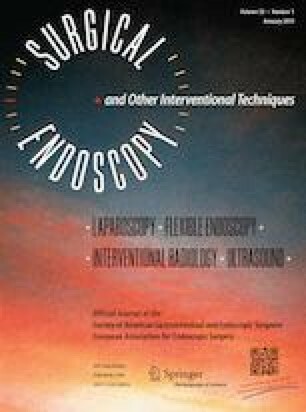 The true learning curve for SPVP-LDP was indicated as 16 cases in a group of surgeons with no experience of laparoscopic pancreatic surgery. Hyung Sun Kim, Joon Seong Park, and Dong Sup Yoon have no conflicts of interest or financial ties to disclose.